Begin by saving on shower time. Every minute that you spend under the faucet, you waste approximately five gallons of water. Don’t languish under the warm water, but get out as soon as possible. Washing regularly is also bad for your hair. Unless you’re exercising every day, try to give yourself shower-free days in between scrubbing. This one’s a no-brainer: when peeling off your makeup before bed, don’t leave the tap running – the same goes with brushing your teeth. Only use what you have to. How many times have you thrown out a shower gel or foundation with some product left in the bottom? Cut open bottles and fish out every last drop before recycling. Although most shower products will probably only be good for a few more washes, some makeup can last for weeks afterwards. It’s common knowledge that hair drying is bad for your locks. Save on energy by air-drying your tresses for as long as possible before blow-drying. Where possible, let your strands dry naturally. One-use makeup tools are a massive waste of time and money. Instead, invest in high quality brushes to apply your makeup. On those days where you forgot to clean your foundation brush before bed, just use your fingers. 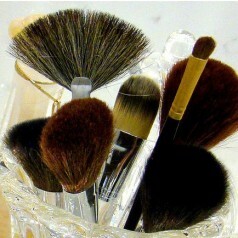 Clean hands heat up your beauty products before you apply them, leading to a more natural look. If you have an eco-friendly salon in your area, always go to them for your treatments. Not only are you supporting green businesses, but they’re likely to stock a variety of organic products that don’t harm the environment. Search online for your nearest green stylist. From solar-powered equipment to charitable donations, you may be surprised at what you’ll find in your area. Don’t fall into the honey-trap deals at supermarkets. Leaving with ten bottles of your favourite shampoo may sound like a good idea at the time, but you’ll just end up with a backlog of beauty products that will gather dust and take up real estate in your home. Where possible, buy large items that are value for money and cut down on packaging. Alternatively, refillable packages work wonders on minimising waste, and work out pretty cheap too. Consider the air miles that have gone into transporting your product. If you can purchase locally-sourced makeup or beauty solutions, then do so. Farmer’s markets are great places to look. They’ll usually at least include soaps. This article was written by Zoe, a British eco-beauty journalist. 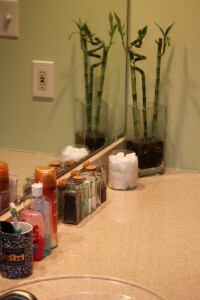 Get green salon equipment to make your beauty routine environmentally-friendly.